Venue, Kew Gardens. Paloma Blanca Dress. Images by Story + Colour. What a lovely wedding we have here. 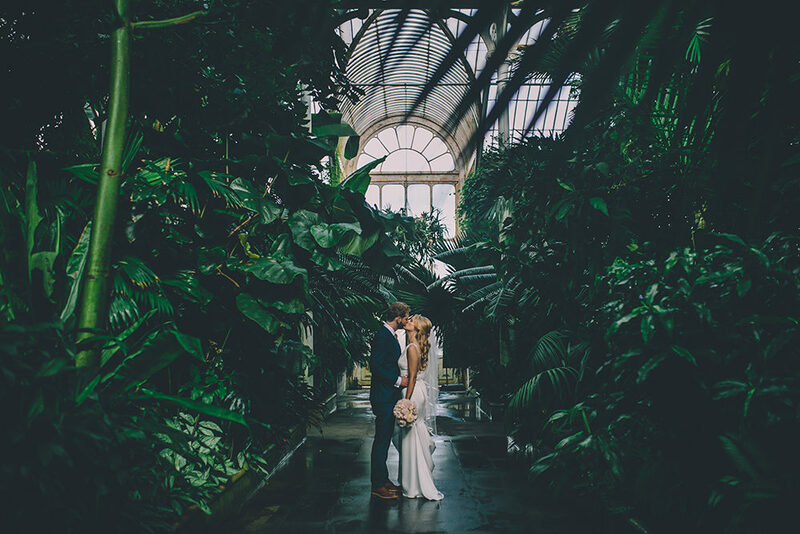 Cambridge Cottage at the Royal Botanic Gardens Kew is the sensational backdrop and location for a personal Civil Ceremony and Prosecco and Gin Party. Bride Flora wears a stunning dress by Paloma Blanca from Pure Couture Bridal with delicate belt detail and every girl’s favourite, Jimmy Choo’s. We are loving the two cake trend, one savoury and one sweet and the two here are a dream. Flora and Tom opted for a show-stopping cheesecake by their caterers Richmond Creative and Rock My Wedding’s The List member Designer Cakes by Elle provide’s a four tier masterpiece with apple and cinnamon with salted caramel, red velvet, coconut and lime, vanilla with rose flavoured buttercream layers and a traditional fruit cutting cake. HELLO!!! 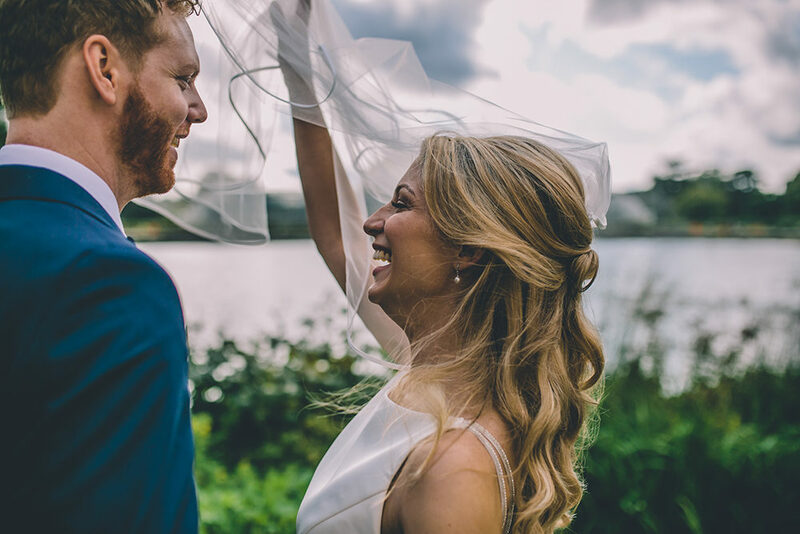 This wedding is beautifully photographed by our friend Dan at Story + Colour. You can swoon at Dan’s work over on Grace & Tom’s colourful wedding and Fran & Matt’s urban cool humanist ceremony. A Quintessentially British Venue at Cambridge Cottage, Royal Botanic Gardens Kew. Bride Wears Paloma Blanca from Pure Couture Bridal and Groom Wears Tailored Suit from Hackett London. 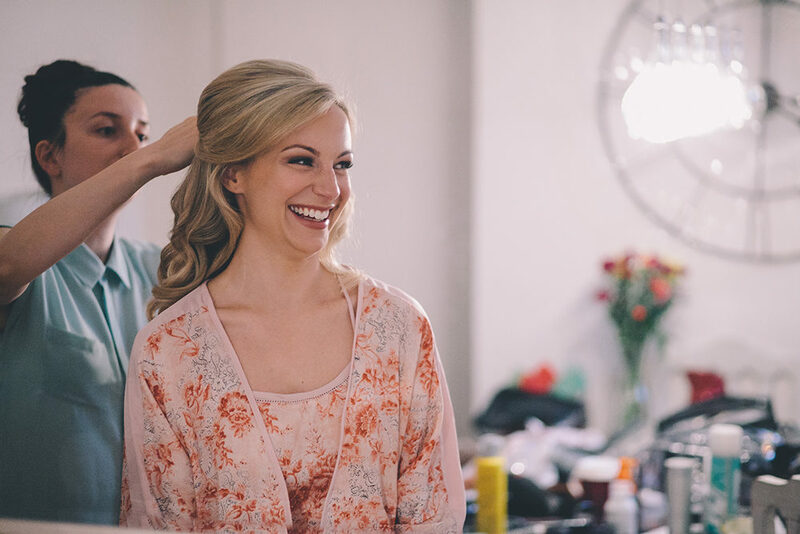 Bride’s Morning Preparations. A Quintessentially British Venue at Cambridge Cottage, Royal Botanic Gardens Kew. Bride Wears Paloma Blanca from Pure Couture Bridal and Groom Wears Tailored Suit from Hackett London. Civil Ceremony. Harpest Entertainment. A Quintessentially British Venue at Cambridge Cottage, Royal Botanic Gardens Kew. Bride Wears Paloma Blanca from Pure Couture Bridal and Groom Wears Tailored Suit from Hackett London. Civil Ceremony. A Quintessentially British Venue at Cambridge Cottage, Royal Botanic Gardens Kew. Bride Wears Paloma Blanca from Pure Couture Bridal and Groom Wears Tailored Suit from Hackett London. Bridesmaids Warehouse Dresses from ASOS. A Quintessentially British Venue at Cambridge Cottage, Royal Botanic Gardens Kew. Bride Wears Paloma Blanca from Pure Couture Bridal and Groom Wears Tailored Suit from Hackett London. Details and Signage. A Quintessentially British Venue at Cambridge Cottage, Royal Botanic Gardens Kew. Bride Wears Paloma Blanca from Pure Couture Bridal and Groom Wears Tailored Suit from Hackett London. Brides Journey. A Quintessentially British Venue at Cambridge Cottage, Royal Botanic Gardens Kew. Bride Wears Paloma Blanca from Pure Couture Bridal and Groom Wears Tailored Suit from Hackett London. 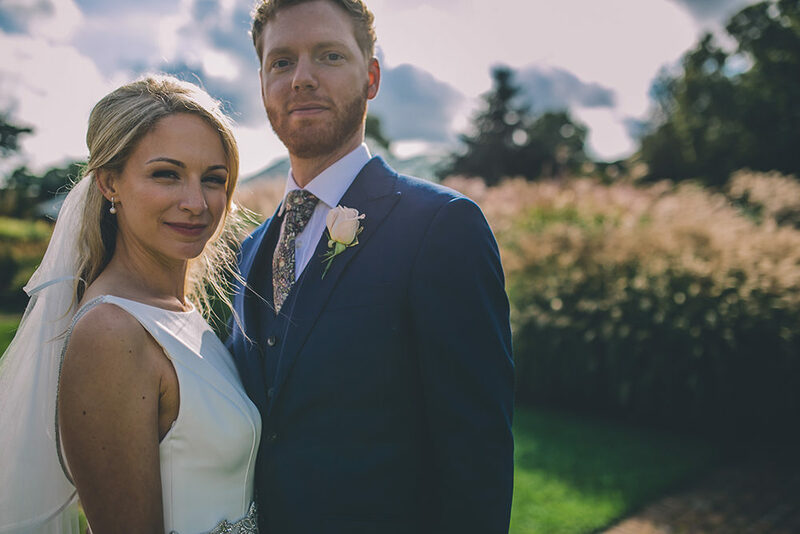 Flora the Bride: Tom and I had been together for 10 years before he popped the question, so we had a really good idea about the kind of wedding we wanted and the things that were most important for us to focus on – good food, good alcohol and good fun! That said – it didn’t make choosing the venue any easier and I think we may win the trophy for most wedding venues visited EVER! We both absolutely loved planning our wedding, and it’s something I wish I could do as a dream job for other people! We planned and arranged everything ourselves which was a lot of hard work but meant we could have exactly what we wanted, knowing it would be totally bespoke and ‘us’. The Brides Paloma Blanca Gown. Before I went dress shopping I had an idea of what I wanted – a lace dress with button detail on the back and lace sleeves – quite clearly, I went for the total opposite! I tried on so many pretty lace dresses and as much as I loved them they just didn’t feel right when I tried them on. I found lace to be quite heavy and started to feel a little overwhelmed by the choice. 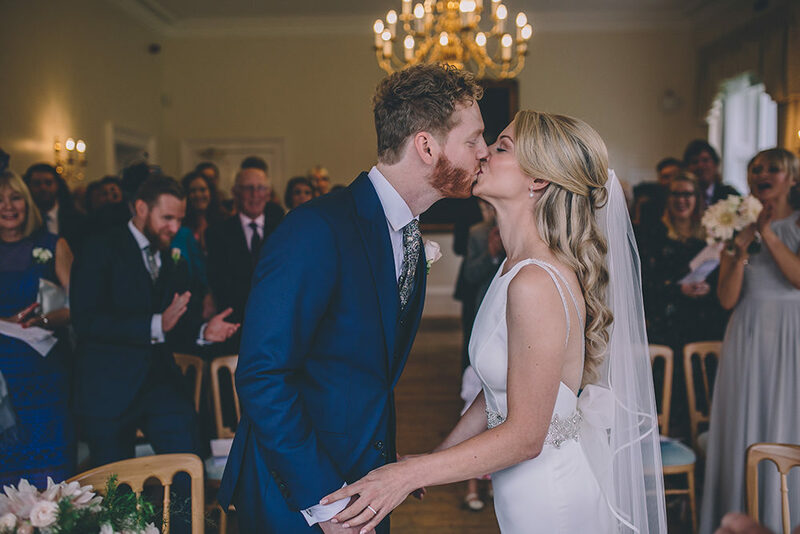 The dress I chose was a Paloma Blanca satin dress from Pure Couture Bridal with a gorgeous belt and glitzy strap detail – I loved it as soon as I put it on. It made me feel as though I was red carpet ready, and that’s how I wanted to feel on my wedding day – totally glam but in an understated way. I wanted a pair of shoes that I would wear again, so chose a beautiful pair from Jimmy Choo which were incredibly comfy and glitzy. A little more than I had planned to spend but totally worth it. Tom bought my pearl earrings as a surprise from Macey’s in San Francisco and my hairpin was from the boutique I bought my dress from. The Grooms Tailor Made Hackett Suit. Tom really enjoyed choosing his suit. He doesn’t wear a suit often because his work has a fairly casual dress code so I think he really wanted to get something a little special but that also suited his personality. He, the best man and ushers all wore tailor-made suits from Hackett, with the best man and Tom wearing a waistcoat to match They wore a Liberty fabric silk tie which had a botanical print and wore Russel and Bromley tan brogues. 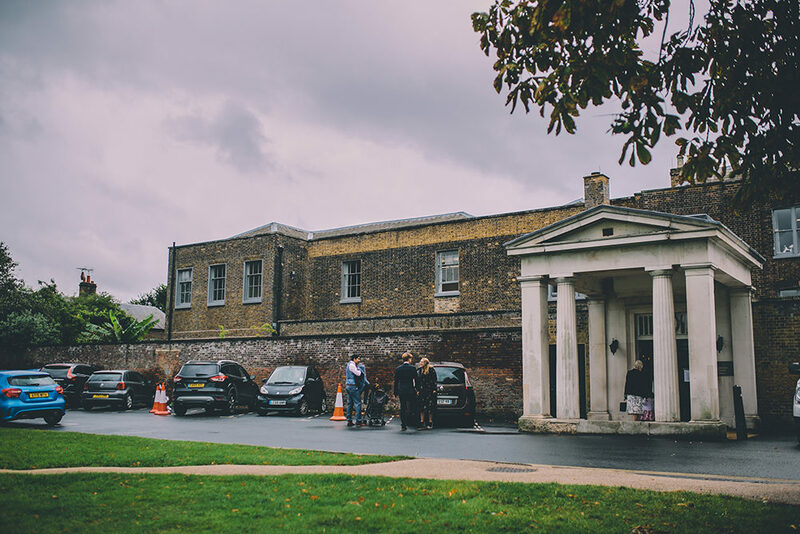 The Venue, Cambridge Cottage, Kew Gardens. We fell in love with Cambridge Cottage as soon as we stepped foot through the door. It was light and airy, with gorgeous floor to ceiling windows opening out to a stunning private garden, with Kew Gardens beyond. The venue was the perfect blank canvas for us to create a truly memorable day and the space worked really well for us and our guests. It was important for the venue to mean something to us, I used to visit Kew with my Dad when I was little and I love flowers, so it held a special place in my heat. It’s also somewhere we can go back to year after year to reminisce. 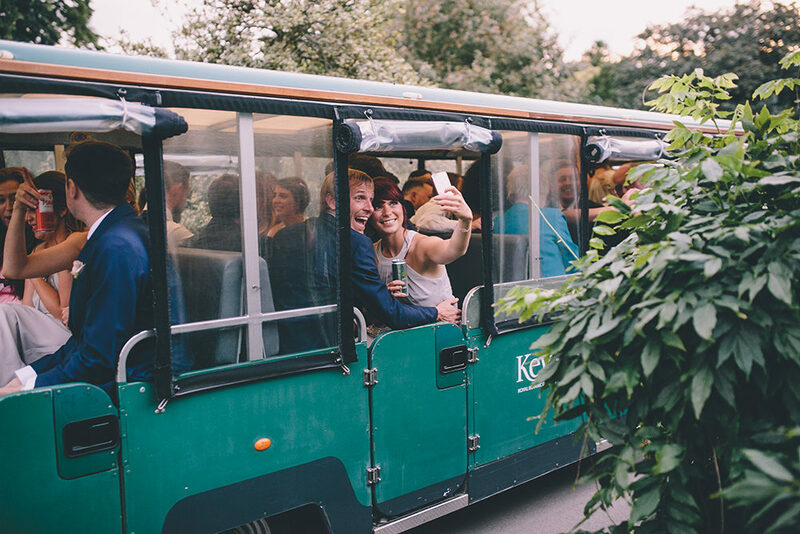 One of the highlights was going on a trip around the gardens on the Kew Explorer at sunset with our guests merrily singing and laughing – I think people could hear us coming from miles! Colour Scheme & Décor, Dusty Pink, Grey, Gold and Botanical Greenery. For me the whole scheme started with the flowers, so once we had chosen them everything else fell into place. We went for a dusty pink, grey and gold colour scheme with lots of botanical greenery to add a pop of bright colour. Tom’s friends who own a graphic design company ‘Daughter’ created all our wedding stationery designed around my wedding bouquet – from the order of service to the menu settings. We purchased some gold safari animals for the menu stands as a nod to our honeymoon destination (South Africa) and found a local team called ‘Three Birds’ who created all our wedding signage (mirror table plan, the order of service, fun signage in the toilets, sweet bags etc). I also really enjoyed finding little props for the bar, photo booth and tables from vintage shops and on eBay. I bought an old mirror and painted it grey and gold to tie in with our colour scheme for the seating plan. It was all the little things that seem like a lot of hassle but when you see it all come together it feels so worthwhile! For the kids I created bespoke goodie bags for them with personalised stationery, toys and fun things to keep them entertained – Etsy is great for this! Our florist Nicola from Flowers by Eve was recommended to us by our wedding cake lady, so we met up with her at Kew and talked through some ideas we had. For me, the flowers were one of the most important aspects of the day and being at Kew made it feel even more important that we did the venue justice. I knew what colour scheme I wanted for my bouquet and that I had to have roses and dahlias. Tom had some great ideas for the table arrangements too. Nicola was so lovely and helpful at guiding us and recommending ways we could achieve the look we wanted without spending a fortune. I was totally overwhelmed by how beautiful she had made the venue look on the day. The Wedding Party Fashion, Bridesmaids. Bridesmaid dress shopping was a nightmare – I bought and returned what felt like hundreds of dresses. 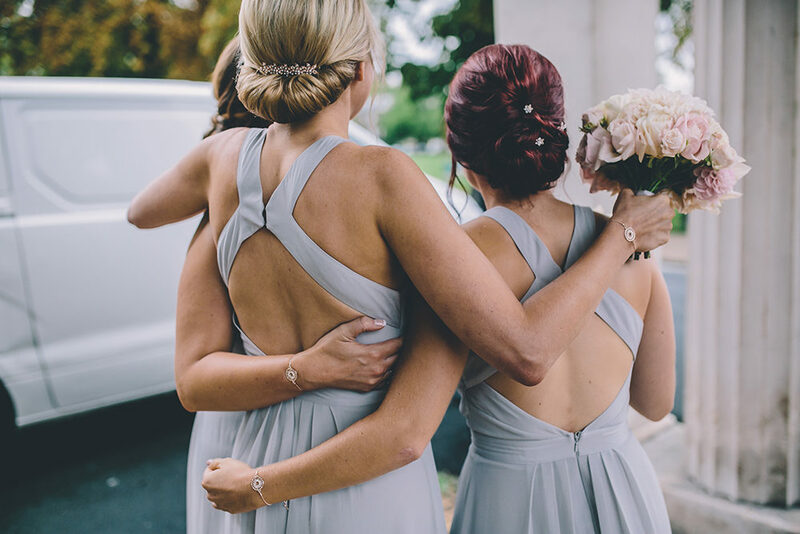 I found it really hard finding a style and colour that suited all of my beautiful bridesmaids that was available in the sizes I needed and wasn’t out of my budget. The one we went with was from ASOS. I had a seamstress alter them all so that they fitted perfectly and was so pleased with the result. The fabric felt and looked good quality and they looked incredible on the day. Their shoes were from ASOS too, and I bought their hair accessories from John Lewis bridal range. They did their own makeup and Kasia styled their hair, I wanted them to all have a different style that they felt comfortable with and I think Kasia achieved this beautifully. We aren’t religious so opted for a civil ceremony as it felt more relaxed. It was lovely to have the whole day in one place, and Cambridge Cottage had a beautiful room for this which overlooked the garden. Civil Ceremonies are usually quite short, so we included three readings from my Mum, our bridesmaid Sam and friend Nick. Each of them chose a reading that they felt represented our relationship or had a nice meaning behind it. It made the ceremony feel more personal and was so lovely to hear the reading they had chosen for us. Isabella from Prelude Entertainment played the harp for a 3-hour set while our guests arrived at the venue and after the ceremony. I walked down the aisle with my Dad to a song from the film ‘Romeo and Juliet’ as this was the first film Tom and I watched together all those years ago when we first met. During the day we had garden games set up outside for the kids and after the meal, our guests went on a trip around the gardens on the ‘Kew Explorer’ which was really good fun. We wanted to create a relaxed party atmosphere in the evening to suit all our guests so had three rooms which were set up slightly differently. One room with a personalised vintage sweet cart and large ‘Pimp your Prosecco/Gin’ bar with over 20 varieties of gin, tonic water and Prosecco along with fruit and bar paraphernalia for people to have fun with. We had a live acoustic duo Mac and Nat play for 3 hours in the central room when our evening guests arrived, and a DJ who played later once everyone was in the mood to dance. The third room was set up with a vintage photo booth, our wedding cake, cheesecake and rebellion beer stand along with a few bar tables and stools. It made for a lovely day that flowed really well into the evening. We chose Richmond Caterers to do all our catering as their food was delicious and the service was seamless. They were completely accommodating and created a dessert especially for us as we wanted a trio. They also allowed us to supply our own alcohol for the entire day and helped with setting up of the bar areas just as we wanted them to. The food on the day was delicious and we’ve received so many compliments. We served a selection of hot and cold canapés during the drinks reception, a three-course wedding breakfast with coffee and truffles, and bacon butties in the evening. We also had a large wedding cheesecake in the evening along with condiments, crackers and bread which we got from The Fine Cheese co which was amazing – you can buy tasting boxes from them before your wedding if you can’t decide what cheeses to go with, another excuse to try some delicious food! Our wedding favours were a variety of different flavour macaroons from Birdy Macarons and looked so pretty on the tables. Choosing the cake was one of the most fun elements of wedding planning – and the tastiest! We found Elle after reading some really good reviews online, so met her at her house in Richmond for a tasting and to chat through ideas. We had an idea of the style of cake we wanted, brushed pearly, pale pinks, gold and fresh flowers to tie in with our theme for the day. We wanted each tier to have a different colour, texture and flavour. Elle was amazing at recommending icing techniques, flavours and ways we could achieve the look we wanted, and most importantly – here cake was delicious! We opted for a 4 tier cake, the flavours were ‘apple and cinnamon with salted caramel’ ‘red velvet’ ‘coconut and lime’ ‘vanilla with rose flavoured buttercream’ and a traditional fruit cutting cake. I was so amazed with the result on the day and Elle has since won a very well-deserved award for her wedding cakes! Tom found our photographer Dan from Story + Colour, after a colleague recommended him, we loved his style after looking at his website so met him at Kew for a chat. We knew within seconds that we wanted him to shoot our special day. 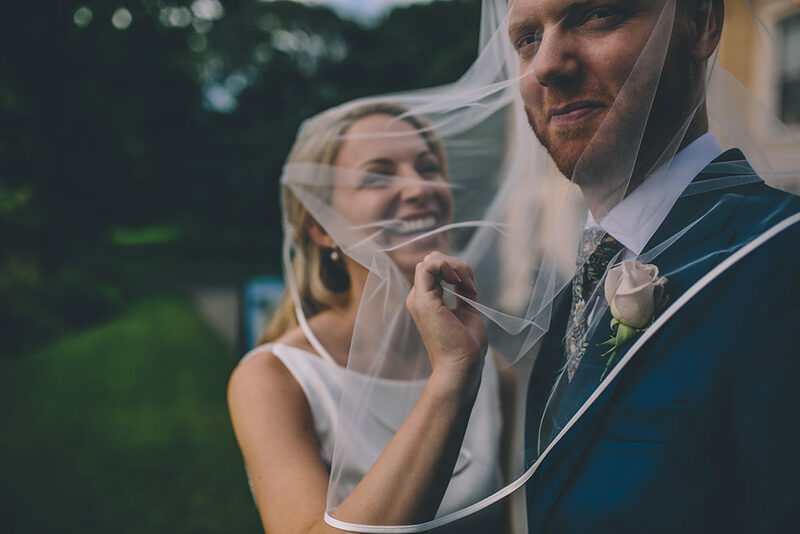 Dan was so easy-going, friendly and calm that he put us at ease immediately, we didn’t want a pushy photographer who would take lots of unnatural and staged looking group shots – we wanted a more relaxed and documentary style of imagery. Meeting for a pre-engagement photo-shoot was such a good idea too as it got us used to being in front of the camera. On the day Dan was incredible – he was so discreet and calm, and he captured the moment perfectly. We couldn’t be happier with the result and will treasure the photos forever. Cambridge Cottage, Royal Botanic Gardens Kew. Bride Wears Paloma Blanca from Pure Couture Bridal and Groom Wears Tailored Suit from Hackett London. Flowers by Flowers by Eve. Cake by Rock My Wedding’s The List Member Designer Cakes by Elle. The Bride and Groom Share Some Time Together. A Quintessentially British Venue at Cambridge Cottage, Royal Botanic Gardens Kew. Bride Wears Paloma Blanca from Pure Couture Bridal and Groom Wears Tailored Suit from Hackett London. Photo Booth Fun. A Quintessentially British Venue at Cambridge Cottage, Royal Botanic Gardens Kew. Bride Wears Paloma Blanca from Pure Couture Bridal and Groom Wears Tailored Suit from Hackett London. Table Settings. A Quintessentially British Venue at Cambridge Cottage, Royal Botanic Gardens Kew. Bride Wears Paloma Blanca from Pure Couture Bridal and Groom Wears Tailored Suit from Hackett London. Notelets. A Quintessentially British Venue at Cambridge Cottage, Royal Botanic Gardens Kew. Bride Wears Paloma Blanca from Pure Couture Bridal and Groom Wears Tailored Suit from Hackett London. Guestbook. A Quintessentially British Venue at Cambridge Cottage, Royal Botanic Gardens Kew. Bride Wears Paloma Blanca from Pure Couture Bridal and Groom Wears Tailored Suit from Hackett London. Gin in a Tin. A Quintessentially British Venue at Cambridge Cottage, Royal Botanic Gardens Kew. Bride Wears Paloma Blanca from Pure Couture Bridal and Groom Wears Tailored Suit from Hackett London. Bubbles for Guests. A Quintessentially British Venue at Cambridge Cottage, Royal Botanic Gardens Kew. Bride Wears Paloma Blanca from Pure Couture Bridal and Groom Wears Tailored Suit from Hackett London. Catering by Richmond Creative. A Quintessentially British Venue at Cambridge Cottage, Royal Botanic Gardens Kew. Bride Wears Paloma Blanca from Pure Couture Bridal and Groom Wears Tailored Suit from Hackett London. Prosecco and Gin Bar. A Quintessentially British Venue at Cambridge Cottage, Royal Botanic Gardens Kew. Bride Wears Paloma Blanca from Pure Couture Bridal and Groom Wears Tailored Suit from Hackett London. Table Settings.A Quintessentially British Venue at Cambridge Cottage, Royal Botanic Gardens Kew. Bride Wears Paloma Blanca from Pure Couture Bridal and Groom Wears Tailored Suit from Hackett London. Prosecco and Gin Bar.A Quintessentially British Venue at Cambridge Cottage, Royal Botanic Gardens Kew. Bride Wears Paloma Blanca from Pure Couture Bridal and Groom Wears Tailored Suit from Hackett London. Cake by Rock My Wedding’s The List Member Designer Cakes by Elle. A Quintessentially British Venue at Cambridge Cottage, Royal Botanic Gardens Kew. Bride Wears Paloma Blanca from Pure Couture Bridal and Groom Wears Tailored Suit from Hackett London. Signage. A Quintessentially British Venue at Cambridge Cottage, Royal Botanic Gardens Kew. Bride Wears Paloma Blanca from Pure Couture Bridal and Groom Wears Tailored Suit from Hackett London. The Kew Explorer. A Quintessentially British Venue at Cambridge Cottage, Royal Botanic Gardens Kew. Bride Wears Paloma Blanca from Pure Couture Bridal and Groom Wears Tailored Suit from Hackett London. Dancing. A Quintessentially British Venue at Cambridge Cottage, Royal Botanic Gardens Kew. 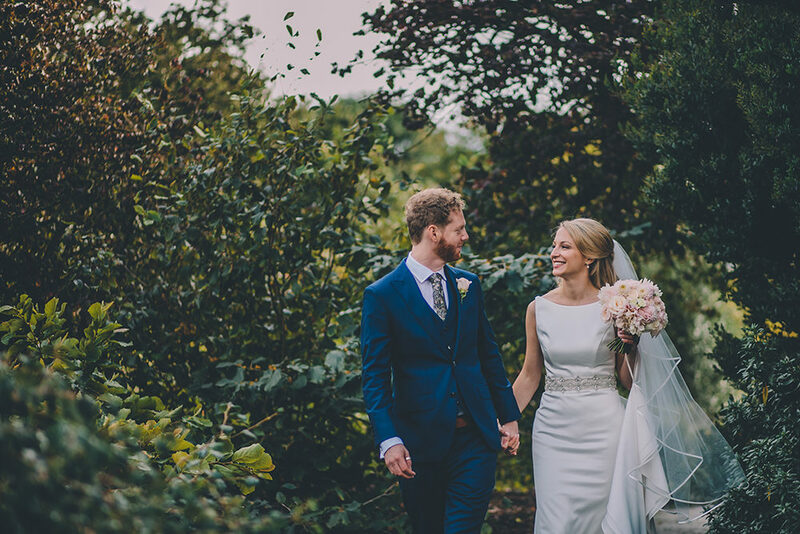 Bride Wears Paloma Blanca from Pure Couture Bridal and Groom Wears Tailored Suit from Hackett London.